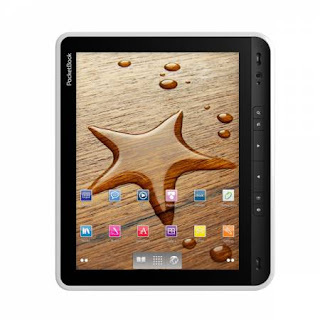 Pocketbook has introduced their latest tablet A10 this week at the IFA conference. Earlier they are primarily known for their e-readers. This model is powered by Android Gingerbread with a 10inch screen. Though the operating system doesn’t seem to be the latest one as a lot of devices are offering Honeycomb, but they have brought up a new look on the tab. The tablet is mainly inspired by a wing of an airplane; the base is flat while the screen and the extended white portion of plastic are kind of providing an aerodynamic feel. On the rear is a white plastic around a soft, rubbery back. The row of physical buttons located on the bottom of the bezel. The tablet has a 1GHz TI OMAP 3621 processor and is provided with storage of 4GB. The model will be provided with a Wi-Fi and an optional 3G. By looking at its specifications it does not seem to be a very powerful tablet as most of the tabs are providing Tegra processors. Now with PocketBook, usually building e-readers this model also provides proprietary software built around the e-book experience and page buttons built in. The company is also looking to possibly position the device for the educational sector. Pocketbook is planning to launch the model in Europe by October, with a price of 300Euros (about $423). The company is also planning to make it available in the US.